This article is about the Major League Baseball team. For the law enforcement agency the team is named after, see Texas Ranger Division. For other uses, see Texas Rangers. 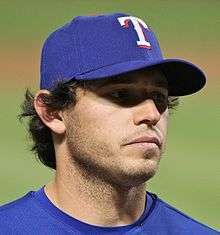 The Texas Rangers are an American professional baseball team based in Arlington, Texas, located in the Dallas–Fort Worth metroplex. The Rangers franchise is currently a member of the West division of the American League (AL) in Major League Baseball (MLB). 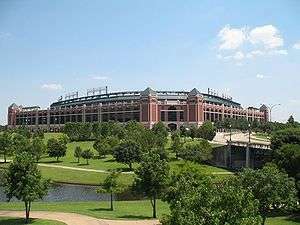 Since 1994, the Rangers have played in Globe Life Park in Arlington in Arlington, Texas. The team's name is borrowed from the famous law enforcement agency of the same name. 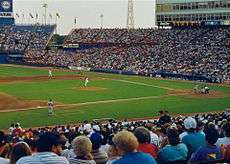 The franchise was established in 1961 as the Washington Senators, an expansion team awarded to Washington, D.C., after the city's first American League ballclub, the original Washington Senators, moved to Minnesota and became the Twins. 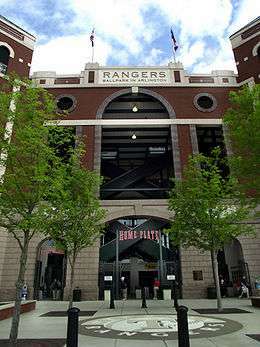 After the 1971 season, the new Senators moved to Arlington, Texas, and debuted as the Rangers the following spring. 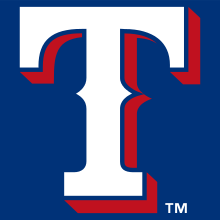 The Texas Rangers Baseball Club has made seven appearances in the MLB postseason, six following division championships in 1996, 1998, 1999, 2010, 2011, and 2015 and as a wild card team in 2012. In 2010, the Rangers advanced past the Division Series for the first time, defeating the Tampa Bay Rays. 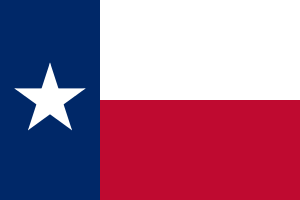 Texas then brought home their first American League pennant after beating the New York Yankees in six games. In the 2010 World Series, the franchise's first, the Rangers fell to the San Francisco Giants in five games. They repeated as American League champions the following year, then lost the 2011 World Series to the St. Louis Cardinals in seven games. When the original Washington Senators moved to Minnesota in 1960 as the Twins, Major League Baseball decided to expand a year earlier than planned to stave off the twin threats of competition from the proposed Continental League and loss of its exemption from the Sherman Antitrust Act. At the winter meetings that year, it awarded a new team to Los Angeles (the Angels, now the Los Angeles Angels of Anaheim) as well as a new team in the nation's capital. This new team adopted the old Senators name, but was (and still is) considered an expansion team since the Twins retained the old Senators' records and history. The Senators and Angels began to fill their rosters with American League players in an expansion draft. The team played the 1961 season at old Griffith Stadium before moving to District of Columbia Stadium (now the Robert F. Kennedy Memorial Stadium). Ownership changed hands several times during the franchise's stay in Washington and was often plagued by poor decision-making and planning. Owner Elwood Richard Quesada once wondered why he should have to pay his players because he believed they didn't belong in the majors. He later agreed to a 10-year lease at D.C. Stadium — a move that would come back to haunt the Senators. In 1963, Quesada sold his stake in the club and resigned. Washington stockbrokers James Johnston and James Lemon owned the team briefly, suffering massive financial losses. Johnson died in 1967 and Lemon sold the team a year later to hotel and trucking executive Bob Short, who outbid a group headed by Bob Hope. Short named himself general manager and hired Hall of Famer Ted Williams as manager. Although Williams had never coached or managed at any level of baseball, he seemed to light a spark under the once-moribund Senators. Williams kept them in contention for most of the season; their 86–76 record would be their only winning season in Washington. U.S. President Richard Nixon throwing Opening Day ceremonial first pitch at RFK Stadium on April 7, 1969 with Ted Williams (left) and Bob Short (right, partially obscured by Ralph Houk). During the off-season, improvements were made to Turnpike Stadium, which reopened as Arlington Stadium for the 1972 season. 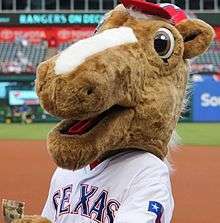 Meanwhile, ownership announced that the franchise would be renamed the Texas Rangers. The team played its first game on April 15, 1972, a 1–0 loss at their expansion cousin California Angels. 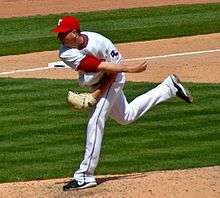 The next day, the Rangers defeated the Angels 5–1 for the club's first victory. After the season Ted Williams retired as manager; he had made no secret of his displeasure with the franchise's new location. Whitey Herzog was named the new manager, but he was replaced before the end of the 1973 season by Billy Martin. Nolan Ryan pitching to Detroit Tigers' Travis Fryman, Arlington Stadium, August 16, 1992. Prior to the 2001 season, star free agent shortstop Alex Rodriguez was signed by the Rangers in the most lucrative deal in baseball history: a 10-year, $252 million contract. The move was controversial and is frequently maligned by fans and writers who thought that owner Tom Hicks was placing too much emphasis on one player instead of utilizing team resources to acquire several players, especially for a team that lacked pitching talent. Club officials maintained that Rodriguez would be the cornerstone of future postseason success. Although Rodriguez's individual performance was outstanding, the Rangers continued to struggle and manager Jerry Narron was fired following the 2002 season. He was replaced by seasoned manager Buck Showalter. Michael Young, Rangers v. Baltimore Orioles, Camden Yards, April 25, 2009. "I'll be the managing partner and CEO. If you like what's going on or you don't like what's going on, I take responsibility for that. When it comes to baseball, I'm not going to interject my opinions. If Nolan and [Jon Daniels] want to discuss something with me, they can, but I have complete faith and trust in the decisions that they make. I'll be as involved as they wish me to be, but with complete faith and confidence in them. What I'm going to focus on, particularly since the baseball side is in great shape, is the business side. How do we connect with the community? How do we create a higher tempo of energy in the front office? How can we do a better job of filling the stands and make an impact on people's lives? If we succeed on the business side and continue on path on the baseball side and combine it with a dynamic market like this is, we can be and should be one of the powerhouse franchises in baseball. " KRLD (AM) NewsRadio 1080 KRLD (AM) will carry any games that conflict with previously scheduled programming on 105.3 The FAN. Former major leaguer Steve Busby is the primary television play-by-play announcer. Since 1982 on both TV and radio, Busby has had various stints in various positions on Rangers broadcasts from play-by-play to color commentary to pre-game and post-game analysis. In June 2012, Busby moved back to his current role after Dave Barnett left his position as game announcer following an episode in which he experienced speech difficulties. Beginning in 2016, Dave Raymond will substitute for Busby on select games. Tom Grieve is the primary color analyst. A former Rangers player and general manager, Grieve has been in the TV booth since 1995 following the end of his tenure as GM. Another former Ranger, Mark McLemore, substitutes for Grieve and has been doing so more often in recent seasons. McLemore often joins the booth for an inning during home games. He and former Ranger Iván Rodríguez are among the pre-game and post-game analysts used on Fox Sports Southwest (FSSW). FSSW pre-game and post-game shows are hosted by a rotation among Dana Larson, John Rhadigan, Ric Renner, and Erin Hartigan. In-game reporters include Jim Knox, Rhadigan, Hartigan, and Rangers employee Emily Jones (formerly of FSSW). 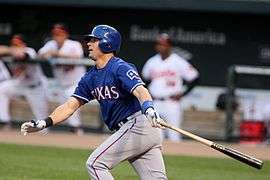 Due to the Rangers having to play many of their Sunday home games at night, the team has been featured frequently on ESPN's Sunday Night Baseball during the summer months. Rangers games can also be seen on MLB on Fox and TBS. ↑ Sullivan, T.R. (January 23, 2009). "Rangers unveil 2009 uniforms". Texas Rangers. Retrieved October 1, 2016.